Hi - My name is RalphP and I'm a newbie to salt water aquariums. I had a couple 55-gallon freshwater tanks several years ago, but this is pretty different. I started up a 90-gallon salt water tank about 8 weeks ago with water, lighting, heaters, gravel and filters, and since then I've been figuring out where to go from here. (This approach to new endeavors has earned me numerous recognitions and rewards over the years, mostly from my wife, none of which you might call positive.) Anyway, since then I've been doing a lot of reading, and added a few more things to the tank: 4 pieces of live rock, a bag of live gravel, a few pieces of dead coral for decoration, an OTB protein skimmer, a starter pack of snails and hermits, a 3-stripe damsel (1½ inch), 2 yellowtail blue damsels (1½ inch), and a yellow tang (3 inch). So far, things have gone pretty well... the tank went through the nitrogen cycle OK, the water chemistries are pretty stable, and I haven't lost any fish. About four weeks ago, I started to get deposits of a white chrystals on the sides of the tank (I'm not sure if they were salt or calcium or something else), and they were pretty difficult to scrub off. I still get them now, but in much smaller numbers. Currently, I have a problem with algae - brown algae in particular, and it's growing all over the tank. It's interesting that the live rock in the tank came covered with coraline algae, and the brown algae hasn't grown there. The dead coral is completely covered in brown algae. Future plans are to eventually develop a reef tank, once I get this algae problem under control and stabilize the environment a little better. I just ordered parts for a sump/refugium, and am gettng an RO/DI for water changes. I was really happy to find this forum - I've been reading it extensively and it's been enormously helpful. I haven't been able to find a good local fish store so this forum has been my main source of advice. I would really appreciate any thoughts or suggestions you might have. Always good to see another salty. What have you been using for water up until now? If you have been using tap, or chemical treatments, it will account for a lot of that algae. Careful with the damsels, they will get really aggressive over time, and you will probably have difficulty adding new fish. 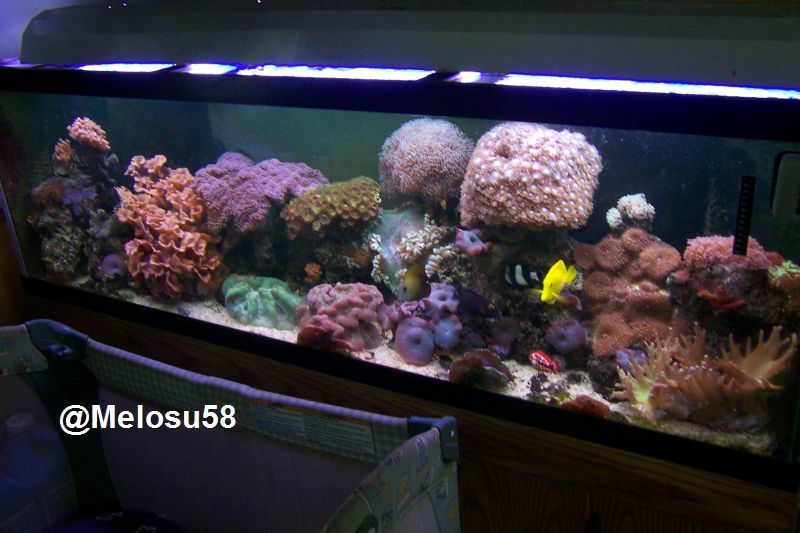 Post up some pictures of you tank and more info in the saltwater section and we can go from there. Welcome aboard. If you have any questions just post them in the SW forums. Not everyone comes to the welcome wagon. welcome to AA and would love to see some pics!! !